Never Forget – Where were you on 9/11/01? 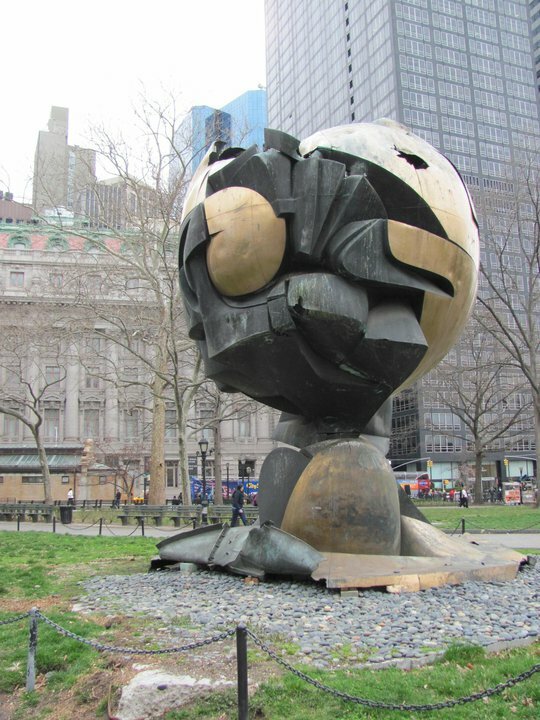 Sculpture that originally stood very near the Twin Towers. Relocated now closer to the Staton Island Ferry, you can see the holes made by falling debris on 9-11, melted metal and twisted pieces. I just happened to be watching the news while having my coffee at 9 a.m. The reporters on the morning show said that there was breaking news from the World Trade Center in New York City. An airliner had run into the North Tower. What a horrible accident! What a strange accident. The pilots and co-pilots must have lost control of the plane, or had heart attacks simultaneously – or some other freak incident that made it impossible to avoid hitting the building. I was listening to the commentator suggesting that it may have been aircraft trouble when I walked into the kitchen to get a bagel. It may have even been the angle of the sun, he was saying. Then another commercial airplane hit the South Tower. By the following cup of coffee, I would live in a different nation. The flames of the first tower hit licked upward through the massive cavernous hole with tragedy. After the second plane hit, the giant plumes of black smoke burned with evil. With the attack on the second tower, the news reporters knew. The people on the streets of New York City, all gazing upward into the endlessly blue September sky? They then knew, too. Watching the towers burn, I stood with my hand over my mouth, not daring to breathe; the air too thick with denial and then dread to inhale. I am not seeing this…I cannot be seeing this. The Pentagon! Another airplane has crashed into the Pentagon! This was not random. This was not an accident. I ran into the next room to wake my brother, who was visiting my family at the time. The Pentagon! I yelled at him, until he opened his eyes. The twin towers and the Pentagon! My brother and I, like so many Americans, watched the news all day. We smoked one cigarette after another, even though I didn’t allow smoking in the house, because it didn’t seem to matter anymore. Our hearts heavy, we watched and cried and touched each other on the shoulder from time to time to make sure that we were real. We saw people jumping out of buildings and delicate papers flutter from the same floors, watched rescue workers walk into towers that would soon collapse. Like millions upon millions the world over, we tuned in find city blocks in ruin, the security command of our nation burning, and a giant hole in a Pennsylvania field made by an airplane that hit the ground so hard that it nearly vaporized. Terrorist attack. Our country – the greatest nation in the world – was under deliberate and devastating attack. When I had taken my children to school that morning, they were careless first and third graders. When I picked them up that afternoon and they excitedly handed me their finger-paint artwork and spelling work from the day, it hit me: My beloved daughters would never know a world in which America was fireproof, bulletproof. As they were small, we tried keeping them from news coverage, but the climate of the world had changed. In the days, weeks and months that followed, the world was justifiably obsessed with the events from that day. On the morning of September 12, 2001, I bought a copy of the New York Times from a newsstand and pored over every page. For months, every magazine featured stories of the innocent victims, heroic responders, and of course, the mass murderers of terror. And then – even as those in the nations that sponsored the terror joyfully partied in the streets – neighborhoods across America became a sea of waving red, white and blue. Political parties? What differences? It was in our similarities that we banded together. We were Americans. I could not imagine how soon all would be forgotten (and even defended) by so many. And each year, on September 11th, there is grieving, as there should be. There is remembrance, because there needs to be. I know that people move on because they have to – that horrors like the Holocaust and 9/11 cannot be fixated upon to the detriment of moving forward. I understand that. But neither should they fade from consciousness, lest a new generation lack compassion for the events and victims’ families for whom “moving on” has meant permanent loss. It was not a freak accident or the angle of the sun that altered our history on 9/11 – but evil, pure and simple. I run this piece each and every anniversary of 9/11. May we never forget.